Get to know our Oysters! Here on our web site, we're featuring a unique selection of oysters. The following are just a few of our featured selections, and some of their native music as well. Canada Cup - A round, medium choice, farm-raised oyster. Consistently sized and well formed cups define this raw bar must-have. Moderately salty with a very firm meat - from Prince Edward Island. Cooks Cove - These premium oysters are harvested in the cool, clear bays and inlets surrounding Malpeque Bay in Prince Edward Island. Once harvested, they are transferred and stored in pristine waters of the Conway Narrows. Here the oyster beds are flushed twice daily by the salt water tides of the Atlantic Ocean. Briny and succulent with a clean fruity finish, the only word to describe them is exceptional. Malpeques - Iron & Beryl, curvaceous, with her flaked shell hardened from centuries in the elements. This is a wild and robust Canadian salwart, perfect for easy shucking and grilling with light lime. Culled from glacial depths of Malpeque Bay - from Prince Edward Island, Canada Long Island Blue Point - Consistently sized, choice oysters - chock full of meat! Louisiana - A year-round favorite and a staple for most restaurants, the Louisiana oyster is harvested from the waters of the Gulf of Mexico in the area stretching from the coast of Louisiana to the bays of Apalachicola, FL. Alonzo's Oyster Bar is part of the Southernmost Restaurant Group, featuring some of the finest dining in all of Florida. Our four signature restaurants here in Key West represent not only a variety of dining experiences, but some of the finest, freshest food available anywhere. 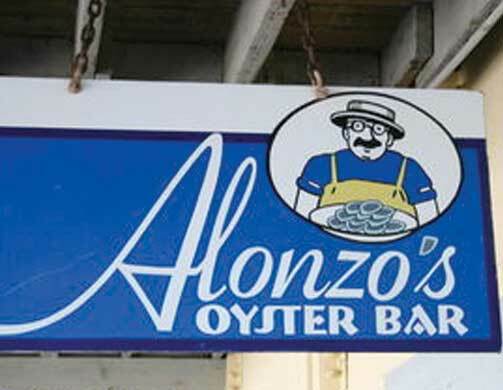 Located at the head of the historic Key West Bight, Alonzo's Oyster Bar is located on the ground floor of the A&B Lobster House. The restaurant building sits near the site of the old Thompson Shrimp Company and continues Key Westâ€™s seafood tradition with the largest selection of seafood found anywhere. We're honored that you've visited us here online and hope you'll check out all of our restaurants when you're in Key West., as well as our affiliated marina, A & B Marina. There's something for everyone and a true sampling of the best that the Southernmost City has to offer.